Let the madness begin. College basketball will crown its champion at the end of its ever-popular 68-team, single-elimination tournament. Before the winner cuts the nets down in San Antonio, millions of Americans will try to predict the outcome using a wide-range of methods from mascots to advanced basketball stats. Here at DTC, we’re using one of our favorite SEO metrics — domain authority — to fill out our brackets. Before we reveal our projected winner and the breakdown of the average domain authority of past winners, let’s do a quick refresh on domain authority. Simply put, domain authority is a metric developed by Moz to indicate the strength of a website and its likelihood to rank for the keywords and phrases it’s optimized for in search engines. It’s calculated on a 1-100 scale with the number of quality links pointing to the site, internal links, technical structure and domain age all affecting the score. The higher the number, the more authority the site has and the higher it will rank in search results. Receiving a backlink from a site with a high domain authority will boost the domain authority of that site. For a deeper dive, check out our blog on domain authority. Link building is a major component of content marketing and can drastically improve not just domain authority, but the amount of organic traffic and qualified leads a website generates. As you’ll see below, university and college websites (.edu) typically have strong domain authorities, because Google recognizes them as reliable and authoritative sources. Backlinks from these websites can boost a site’s domain authority and backlink profile. Whew! Now that you understand domain authority, it’s time to have some fun and pick a winner. 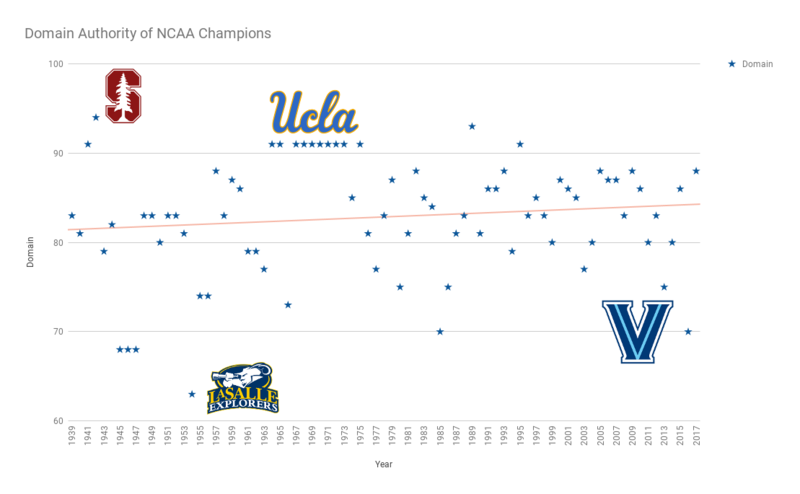 The NCAA men’s basketball tournament has decided the national champion every year since 1939. Now a field of 68, the tournament started as an 8-team field and expanded to the more-familiar 64-team field in 1985 and has crowned 34 different champions in its 79-year history. Let’s take a closer look at the winners and their domain authorities. Please note: We researched the domain authority of the university or college — not the athletic department website many schools also operate. The 2018 field is set with 68 teams from 32 conferences competing for March glory. We’ve pulled the domain authority for every school in the tournament. Take a look at the chart below. You’ll notice that the higher domain authorities correlate with the better-seeded teams. With the field set, it’s time to pick a winner. No crystal ball is needed at Digital Third Coast. We’re confident that by handicapping the tournament with only domain authority, we’ll find a winner. We’re going with the University of Michigan. The Wolverines are coming in hot after winning the Big Ten tournament and have a domain authority of 93 — the highest in the field. Take a look below at how the tournament unfolds using solely domain authority to pick winners. If the Maize & Blue don’t inspire confidence, we recommend picking a school with an average domain authority of 83 — the average domain authority of all previous winners. 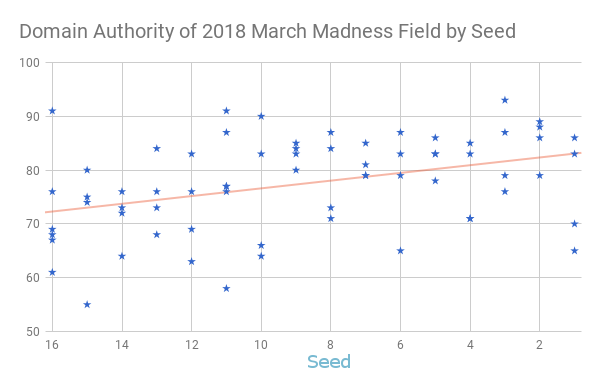 In this year’s field, there are seven teams with that winning domain authority: Kansas (1 seed), Auburn (4 seed), Kentucky (5 seed), Clemson (5 seed), Houston (6 seed), Kansas State (9 seed) and Oklahoma (10 seed). So, instead of just chasing 5-star basketball recruits, colleges and universities should also focus on SEO and link building to boost its domain authority for a chance at March glory. Are you a marketing specialist working in education? Let us know. We just might be able to turn your school into a basketball powerhouse through SEO.